I have been getting requests for a new challenge, so today (and yesterday) I worked on this card. I have lots of hours creating this card as it just didn't come together. I can't tell you how many times I changed the color of the heart. Then when it dried the color changed and was totally different from what I had planned. Have you ever had that happen? I first cut out a country looking heart, covered it with gesso, then covered it with gauze. After it dried, I fan folded it to get it a pleated look. The paper is an older collection from Heartfelt Creations. It is actually more olive green than it shows here. I distressed all the edges to give it a vintage look, sewed some on the sewing machine, added 1/2 of a dolly. Oh. I also used a new embossing folder to make the lines. I hope you like it. Please let me know what you think. You can make as many cards this week as you have time to get done. You will have until Monday September 22 morning 6:00 AM EST to link your project. A winner will be chosen from a random drawing for week #22 and the winner of the challenge will be announced September 23. Lovely! I always like the vintage look. Joan, your card is BEAUTIFUL! You've combined a lovely color palette with texture, and layer after distressed layer of vintage perfection! It is literally a heartfelt creation!! Thank you so much for sharing it with us at the Frilly and Funkie! I know what you mean about struggling at times to get a project to come together, but honestly it looks to as though you brought it together effortlessly. What a lovely work of art!! Such a lovely shabby chic card. 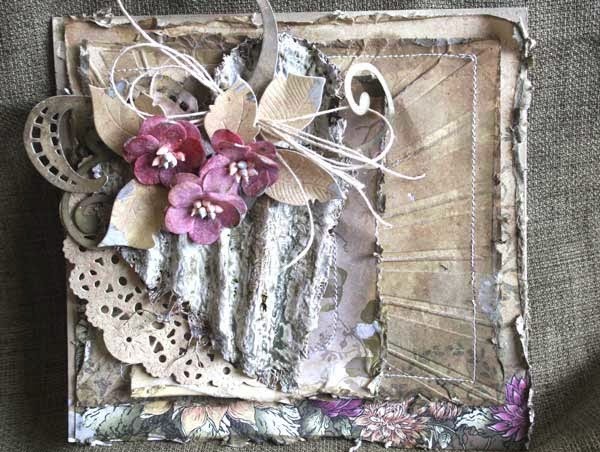 Love all the distressing and your color palette is so perfect for a vintage style card. Your fan folded heart is beautiful. Thanks so much for sharing it with us over at Frilly and Funkie! Beautiful card, Joan! It looks like a lot of hard word went into your creation. I know there are times when it takes me all day to make a card before I'm satisfied with it. But in the end it's all worth it.when that "aha" momenht arrives and you're finally happy with the result. Very pretty, Joan. Your cards are so amazing! Very beautiful card and love the distress edges on this vintage card. GORGEOUS card Joan...love the vintage pretty soft look of it.....the EB folder is awesome and I think I JUST received one like it last week..you have inspired me to use it!! Lots of pretty details here!! Dear Joan, i found your blog today and saw your challenge, so i would like to enter my card to your challenge. Ohh your's is fantastic, i love your style and i'm sure, i will come back and visit your blog. Your creations are stunning. Such a stunning card. Thanks for another challenge. I am a new follower and I was inspired by your challenge! This is the first time I have used my distress tool. I think I need more practice! Your card is beautiful and your distressing looks awesome!